Lady Luck turned her back on the US Open champ as he was forced to take a penalty drop from gorse on the third and was penalised a shot on the seventh when the wind moved his ball as he addressed a birdie putt and he walked off with a bogey. Frustrated after finishing with two bogeys for a 73 that left him tied 25th on seven over, McIlroy said: “It’s been a tough week for me. I felt like I did well the first couple of rounds, and I just struggled a bit in the bad weather at the weekend. “I’m not a fan of golf tournaments that the outcome is predicted so much by the weather. It’s not my sort of golf. “I’m disappointed with the way I finished obviously, but I’ll just have to wait until next year to try and make a good run at this tournament. “I’’m looking forward to getting back and playing in Akron, playing the PGA and getting back into some nice conditions. “My game is suited for basically every golf course and most conditions, but these conditions I just don’t enjoy playing in really. That’s the bottom line. Refusing to change his stance on adjusting his game for Open golf conditions, he said: “I’ll have plenty more opportunities to win an Open. Just five off the lead at halfway, McIlroy’s hopes of winning the Claret Jug ended when he drove out of bounds on the 14th on Saturday and racked up a double bogey seven. He opened his final round with a birdie at the second but and any hopes of a dramatic title charge were dashed when he racked up a double bogey five at the third after carving his tee shot into a gorse bush. Forced to take a penalty drop there, McIlroy suffered a KO when he was penalised a stroke when the wind caused his ball to move as he addressed an eight-foot birdie chance at the long seventh. Summing his week, he said: “I’m bit frustrated. I got a bit down whenever my ball moved on the seventh today. I was just like… I don’t know, it’s just tough. That miss was the last straw for the Holywood hotshot who says he has no intention of changing his style to cope with tough conditions at the Open. Concerned he would mess up his swing for the rest of the year, he said: “I can do it but it’s just being comfortable doing that, and there’s no point in changing your game for one week a year. Looking forward to the Irish Open next week followed by the WGC-Bridgestone Invitational in Akron and the US PGA in steamy Atlanta, he said: “Hopefully if the weather is decent at home. I’m going to spend a few days getting my swing back to where it needs to be. As the rain hammered down, McIlroy explained that he has never been a true wind player despite his back to back wins in the West of Ireland and the Irish Amateur Close championships in 2005 and 2006. He said: “All the amateur tournaments I’ve won, they were played on links courses but they were all relatively calm. Former Ryder Cup skipper Colin Montgomerie criticised McIlroy’s preparation for the Open and his decision to take three weeks off following his Congressional win. He also shot down suggestions that high expectations took their toll following his spectacular major breakthrough four weeks ago. He said: “All I was trying to think about was winning this tournament. There’s no point in coming in thinking I’m the US Open champion, I’m going to do well. You can’t really think like that. Padraig Harrington heaped pressure on McIlroy when hailed him as a player capable of overtaking Jack Nicklaus as the most successful major winner of all time. Rory McIlroy may have to putt like Tiger Woods in his hey-day if he is to take advantage of the 14-time major winner’s absence and win the US Open. All eyes are focussed on the Holywood starlet following his Masters meltdown, wondering if he can bounce back for that heartache to grab his first major win. But McIlroy knows that he will have no chance if he doesn’t hole the putts. And that’s why he will be trying to become the 8-foot monster of Congressional today. Rory McIlroy insists he can’t afford to be in awe of Tiger Woods any more. The US Open champion believes it’s crucial that he puts his admiration for the former world No 1 aside if he wants to become a major force. Hello world. 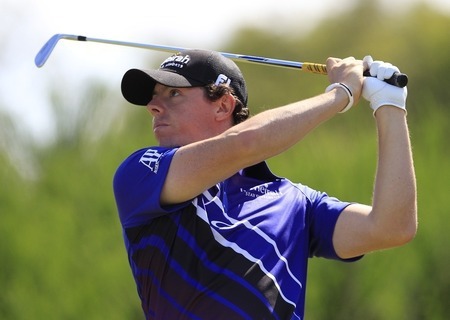 Rory McIlroy turned professional at the Belfry in September 2007He stares his inquisitors directly in the eye but he does so out of interest and not with that famously cold, dead look that made Tiger Woods such an intimidating presence. Rory McIlroy might be a major champion these days but he’s lost little of the youthful enthusiasm for the game that marked his amateur career and it could prove to be a crucial difference between the pride of Holywood and golf’s fallen idol over the next 15 years. Rory McIlroy hits to the 12th in the final round of the Open. 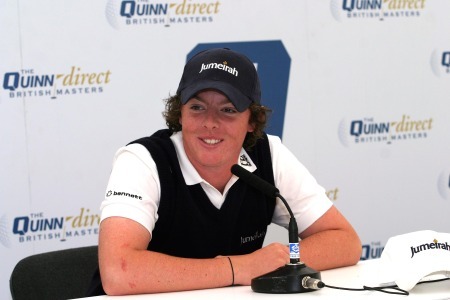 Photo Eoin Clarke/www.golffile.ieRory McIlroy confessed that the chinks in his game were exposed by the major test that is Royal Lytham and St Annes.